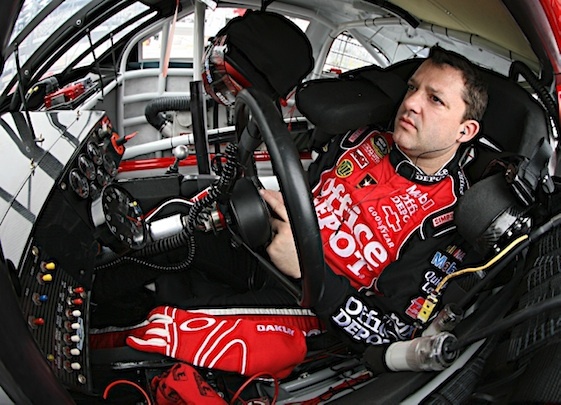 Racin’ Today » Woody: Irony And Tragedy Mingle In N.Y.
Woody: Irony And Tragedy Mingle In N.Y. The first driver I ever saw climb from his car after a crash and dart onto the track to confront another driver as the field came back around was Tony Stewart, when he threw his helmet at Matt Kenseth’s car at Bristol. Since then, we’ve seen more and more drivers do it — climb from their crashed car, storm onto the track, and gesture angerly at the offending driver — including Stewart’s teammate Danica Patrick earlier this year. In a tragic irony, young Kevin Ward was emulating Tony Stewart. I’m weary of some in the media wringing their hands, pontificating and asking “How could this happen?” They are partly to blame. TV in particular has encouraged such reckless behavior by endlessly re-playing the episodes, tacitly glorifying them. Footage of Stewart’s infamous Bristol helmet-throw has been used to promote future races, as commentators chuckle. The message to young drivers is clear: such antics will get them lots of TV exposure, and enhance their reputaton as a Tony Stewart-tough competitor. It eventually got a young driver killed. Woody’s NASCAR credentials are impeccable. I believe he was saying that it was the first he had ever seen this kind of act….in person. I’m sure he has watched on TV, like the rest of us, drivers exit their cars after a crash and vent their frustrations. For more than 35 years, Woody covered NASCAR races, but that doesn’t mean he was in the right place at the right time to actually see such an occurrence. He knows a majority of the drivers and understands their competitive nature. And yes, he and Stewart have had a run in or two….reporters are also competitive. Woody, like Stewart, is first rate and a credit to his profession. You obviously haven’t been watching Nascar very long because that was DEFINITELY NOT the first time anyone exited their car and threw something at another driver. I’ve seen that many many times over the years. Robby Gordon was one of the worst for doing that. If you think Larry Woody hasn’t been watching NASCAR very long, you obviously haven’t been paying attention to the sport very long. Woody’s career as a respected NASCAR journalist is at a minimum in its fifth decade. The only two people I have ever heard questions Woody’s credentials are you and Tony Stewart, who called him local. NASCAR, by the way, is written in all caps. It is an acronym. Words in the middle of a sentence are not.